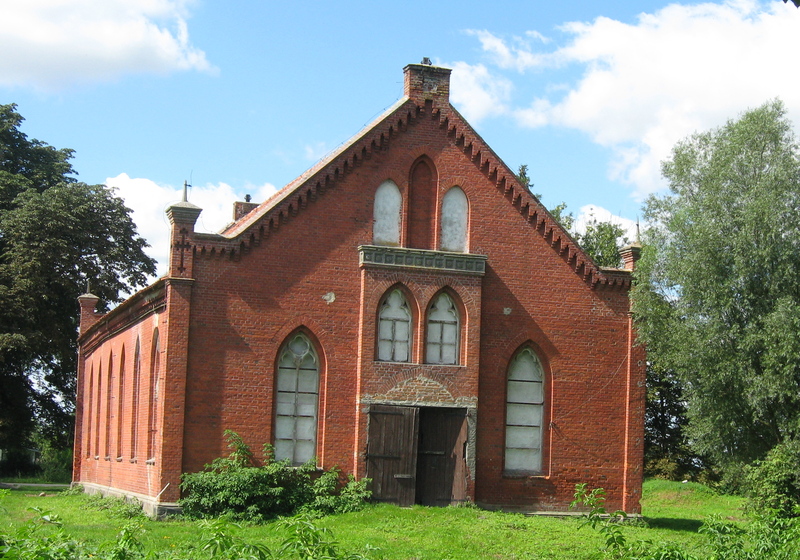 The former Mennonite church at Thiensdorf (Jezioro), now used for storage. Mennonite Heritage Tour: encounters with women (part 7 of 8). As my reflections on our Mennonite Heritage Tour wind their way into Poland and soon to an end, I have to confess in advance that this post is a bit of a stretch as far as the “encounters with women” theme is concerned. 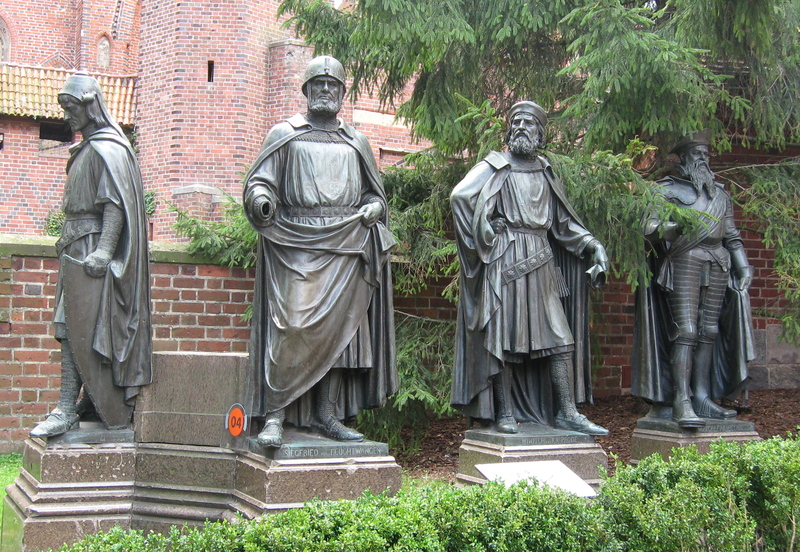 Poland — or “Prussia” as we also think of it in Mennonite history – made its connections to me through place(s) rather than people. We spent time in Gdansk (Danzig) and the Vistula Delta. There was Neptune again, at the fountain just across from our lodgings on Long Street in the centre of the city, designed as it turns out, by a Mennonite, Abraham van den Block, as was the armoury building and the Golden Gate. Mennonites lived in the region from 1540 to 1945, and in spite of any number of restrictions on citizenship and conflict over their beliefs, made their presence felt in the look of the land – the dikes and farmlands of the delta – and in architectural features and innovations of various kinds. In Elbing, we stopped at a museum exhibit on the Mennonites. We spent hours driving about the countryside, viewing former Mennonite homes (of the house-barn or Vorlauben style) and churches, some in good repair and used now by other groups, some falling into ruin. We poked around cemeteries. I don’t know what it is about cemeteries, but it didn’t matter how many we had stopped at already or how overgrown or indecipherable the stones, I was always eager to hop out at the next one. What were we looking for? Nothing – no one – in particular, at least H. and I weren’t, even though both our families came from Poland/Prussia before they came from Russia/Ukraine. Still, it was exciting whenever we spotted “our” names: Doerksen or Harder, that is, for me, and some version of Dueck or Rahn for him. These were the lands we came from and these — generations back — the people. 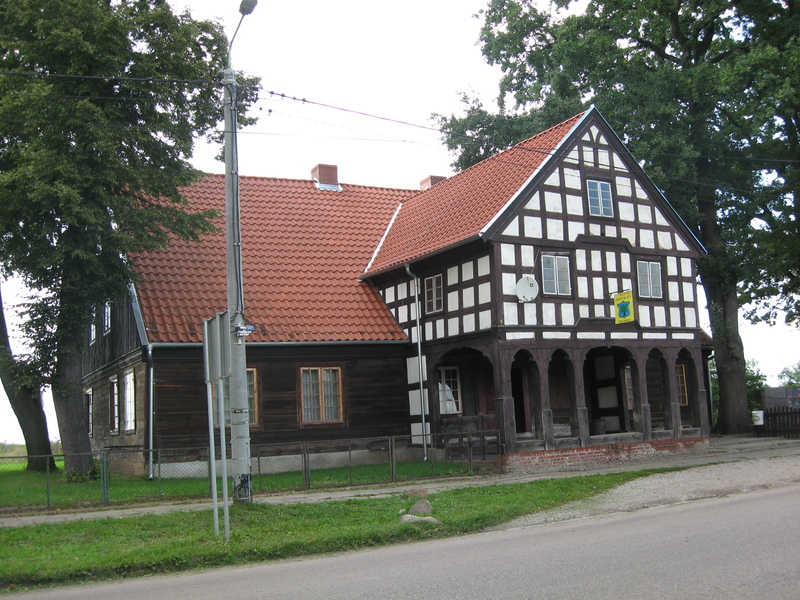 My maternal great-great-great grandfather Peter Harder, a weaver, and wife Maria, were born in the Lackendorf jurisdiction of Elbing, Prussia too. At 40 and 36 they took themselves and their three children, their wagon, plow, cultivator, four horses, seven cattle, 40 cornsheaves and 20 bales of hay off to Russia, where they settled in Fischau. 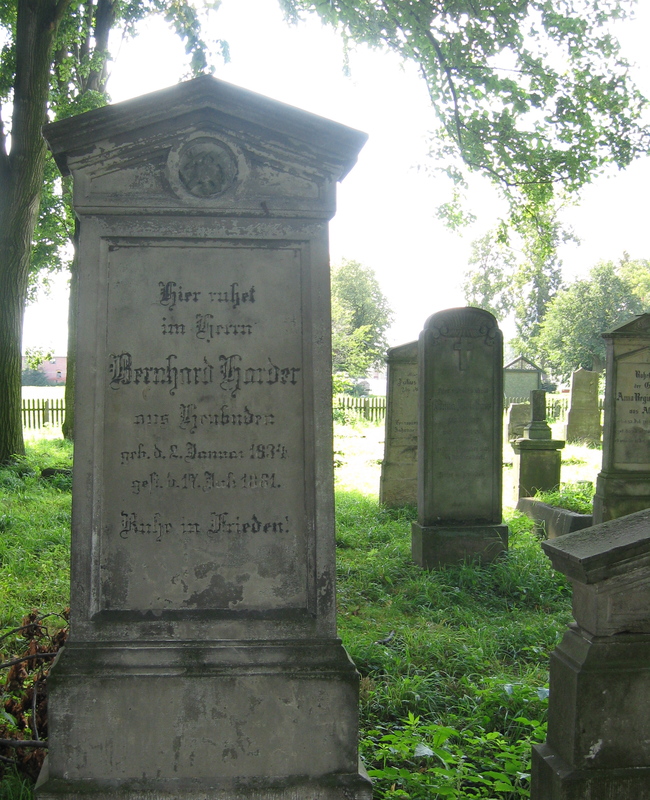 And H’s great-great grandfather Johannes Rahn was from the Altendorf area of Prussia. He later moved to the Crimea, though his brothers stayed in West Prussia. 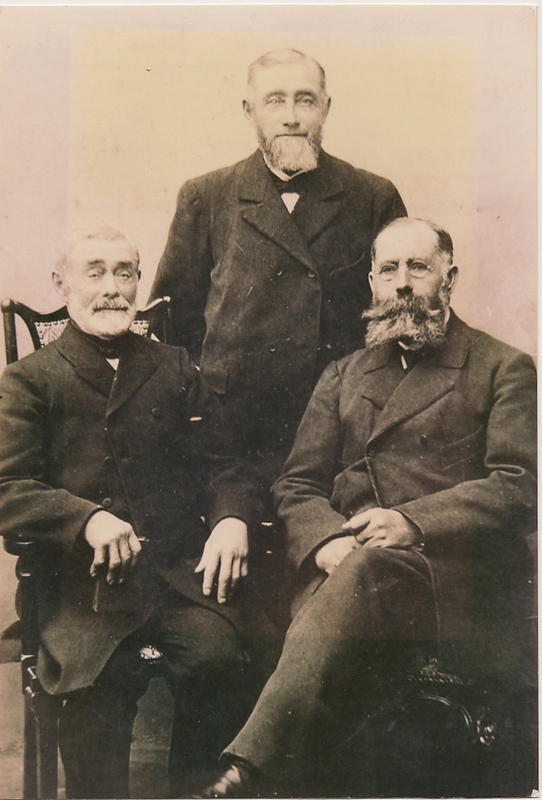 We have a photo of the three of them, in fact, taken there in 1905 (right). If any of “our” names on these stones were relatives, they were distant, probably from some sideways branch. But each gave my heart a little squeeze anyway. 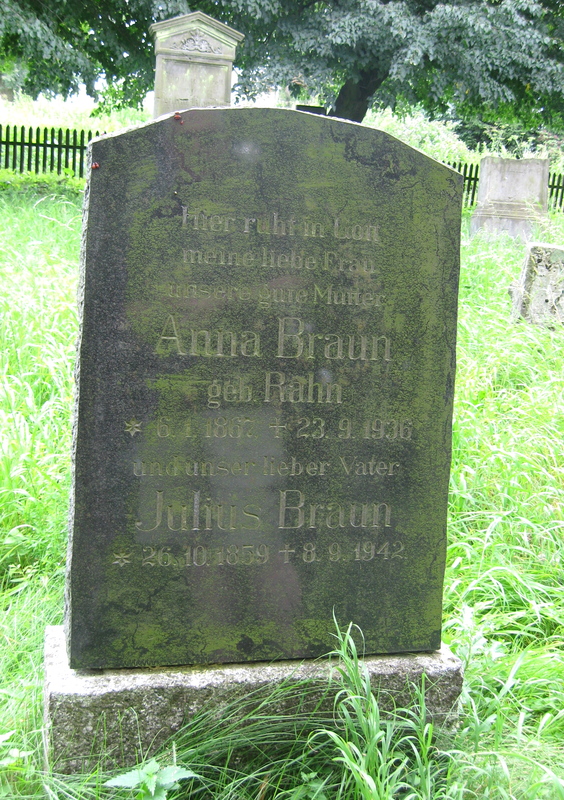 It was a delight to spot, in the cemetery in Heubuden, which is the best restored of the Poland Mennonite cemeteries, an Anna Braun, born Rahn, and to see too that she was called “my dear wife” and “our good mother.” To be married, to be a mother, these are long and demanding and significant roles. Relative or not, I’m glad that Anna’s success at them was appreciated with those words. This entry was posted in Mennonite, Personal, Women's lives and tagged Anna Braun geb Rahn, Heubuden, Mennonite cemeteries, Mennonite Heritage Tour, Vistula Delta by doradueck. Bookmark the permalink. Claassen Family History off and on 10 years or so.I have Cemetery Inscpritions from the Vistula Delta Area where my A ncestors Lived. Great fun, isn’t it, family history? Thanks so much for stopping by and leaving a comment. No I didn’t know that! Thanks. You must be a genealogist? I have to say, we went on the Poland piece of the trip just kind of taking it as it came and not really digging into the family tree on either his or my side ahead of time. Perhaps we’ll have to go again and do more specific searches. I’m very grateful to you. This is exciting, even at a geographical distance!